Second Shooter: Business of Software 2008 - day two, part one. Business of Software 2008 - day two, part one. Steve is an instructor for Pragmatic Marketing. He is also one of the funniest presenters I've heard in a long time. Funny is good - it makes people sit up and pay attention. Steve's presentation was a cornucopia (pulling out the big words today) of great quotes and pithy statements. Starting with my favorite: "Friends build products, enemies build documents." Are you friends, or enemies, with your development-team/product-management group? Another great quote: "Remember, the 'L' in user is silent." Most of us focus on stealing customers from "them" (our competitors), but who is talking to everyone else? Unless you already own the entire market, quit being so worried about the competition and focus on the non-users and evaluators. Tom is a managing director at Summit Partners, a VC firm based on Boston. I didn't take many notes during his presentation, but I did learn a fair bit about how VC's think and work. Find a firm that can offer you concrete assistance with management, leadership, marketing, etc. And to add my own advice (borrowed from Clayton Christensen's work): find a firm that is patient for growth, but impatient for profit. The great geek icon of free and open software was (almost) everything I expected. I won't tell you exactly what I was expecting, but I didn't think I'd hear anything new or original from him. I wasn't dissapointed. One idea he highlighted was how software doesn't suffer from the "perversity of matter". In software we can combine thousands of ideas from thousands of people with very little friction; at least, compared to doing the same thing when building something physical. This was a neat idea, and he provide a couple good metaphors to highlight it. Then he provided a couple more metaphors. Then a couple more. And a couple more. And more. OK already - we get it. Most of his talk was centered around the evil nature of software patents. I am in complete agreement with Stallman that software patents should never have been granted in the first place. And I also agree that we'll have to eventually rip the whole software patent infrastructure up at the roots and dispose of it. I'm not quite as pessimistic about patents' current impact on the industry, but I agree that it is getting worse, and fast. The other idea he shared was an analogy between composing music and writing software. Richard has been sharing this idea for years, and this part of his talk was nearly identical to the ideas he has presented a hundred times before. You can read a great summary of this idea here. If you are trying to get someone non-technical to understand the problems with software patents, this is a great place to start. I couldn't help but think that Stallman would be more effective if he took better care of himself. I know he has a "geek reputation" to uphold, but speaking in front of a large crowd with a dirty shirt, stained pants, and socking feet, just isn't a good way to be taken seriously. Noam is a professor in the Business School at Harvard. I really enjoyed Noam's presentation style. I felt like I was back in school again, with Noam wandering up and down the isles and back and forth across the presentation floor. He asked us question and waited for the responses. It was one of the more engaging talks of the entire conference. Noam presented some of his recent research on the "Rich vs. King" problem when starting a business. The essence of this problem is that most founders of a startup end up with one of two outcomes: they depart the business just as it is getting successful, but they become rich. Or, the stay at the business and help lead it into greatness, but they don't make the huge profits that often result in the other outcome. The academic community agrees that these two outcomes are well established. What isn't well understood is how a founder can choose which outcome they end up with. Noam's research over the past decade has focused on this question and sought to understand the decisions that are pivotal in driving the outcome in one direction or the other. He shared some great startup advice with the group. 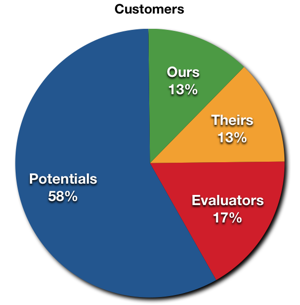 65% of ventures fail because of people-side problems. Founders should not choose friends when looking for people to start a business with. It is too difficult and leads failure. When dividing equity with the initial group of founders, the lead founder should propose unequal equity splits with dynamic adjustments over the first couple years. This keeps everyone focused and incents people to work hard. Many startups begin with 50-50 equity splits, but one founder works much harder than the other, leading to nasty breakups later on. At the start of your business, hire jack-of-all-trades, not specialists. You don't know what you'll end up needing. Hire specialists later. When hiring, focus on "Mr. Right" not "Mr. Right Now". If you are a founder and CEO, the best advice is to initiate your own exit before the investors do. CEO's who take this path end up wealthier and with greater control over the final outcome.